Our own Ben Wojdyla took a hammer to the flippant reference to razing Detroit for farm land online at the NY Times. We agree that just wiping Detroit off the map is a bad idea and, actually, flies in the face of the concepts pushed by Andres Duany, the father of agricultural urbanism. The idea is to integrate agricultural land use into inhabited areas, not replace them. We could go into a long discussion about it, but Van_Sarockin beat us to it as part of an enjoyable thread on the topic. Great piece, Ben. Thanks for wrecking all of our zombie apocalypse/Mad Max fantasies about Detroit. You're right that the article is off base. But there's more to the story, and to the idea than what you present. Urban 'farming' isn't and shouldn't look like large scale US agriculture. It can't be done on large tracts, with large machinery and industrial chemicals - as you point out. And there are issues of preexisting infrastructure and contamination that have to be considered and dealt with responsibly. However, land can be farmed or gardened successfully in large and small plots, from community gardens up to about an acre or so, in a scattered site patchwork approach. Well tended smaller gardens can have values and productivity far in excess of typical large farms. People can intensively tend higher value crops, more closely planted, with multiple yearly harvest by hand, and outstrip what a typical farm can do, mainly by growing vegetables, rather than grains, corn and soy. Maybe this is a hobby for folks, and they don't have to worry about the economics of getting paid. And there's certainly a large gap between what farmers get paid, and what the same items costs in a local market. Plus, you can grow food that tastes better and requires less energy inputs when you're doing it for yourself locally. Detroit and many other cities and towns do have real issue of declining populations to deal with. Uses for all of the vacant buildings, homes, factories and lots have to be found. Maintaining vacant properties in perpetuity is not a solution. If Detroit cannot attract more industry, and find ways to put people to work, people will continue leaving. It is better for there to be a strategy for how best to contend with declining populations and economies, than simply to wade about in the wreckage. 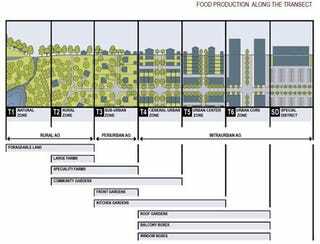 Part of that solution may well include transforming some previously developed areas into agricultural, open space or forested places. This speaks to our belief that better land use policies leads to less energy consumption, less congestion and therefore more fuel and space for us to drive vehicles with large displacement engines.